The symptoms associated with this defect are extremely variable, sometimes being apparent even before birth and sometimes being so slight or absent that the anomaly is not discovered until adulthood. In rare cases, a person with Ebstein's may even live to old age without ever being diagnosed. Those patients who are diagnosed in later life will usually have developed one or more of the following symptoms: an enlarged heart, an arrhythmia (often caused by enlargement of the right atrium), a heart murmur, some degree of cyanosis (blueness caused by low oxygen saturation in the arterial blood supply), or decline in the ability to tolerate exertion. 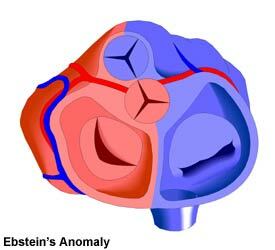 If there are symptoms suggestive of Ebstein's Anomaly, the patient will be examined through the use of electrocardiography (producing an ECG, or electrocardiogram), chest x-ray, MRI (Magnetic Resonance Imaging), and/or echocardiography (producing an echocardiogram). In some cases, a cardiac catheterization procedure may be necessary. Also, exercise testing is often helpful in determining the extent of cardiac dysfunction. Surgical treatment is recommended for adult patients with significant symptoms caused by this defect. In some cases, it will be necessary to replace the tricuspid valve. Those patients with arrhythmias may also receive treatment for these disorders (see next page). The post-operative prognosis is normally quite good and the patient may expect an increase in exercise tolerance as well as a dramatic decrease or disappearance of other symptoms. Those patients who received a valve replacement may need to have it replaced at some point, though the prosthetic valve will usually last for decades. There are varying approaches to the treatment of asymptomatic individuals with Ebstein's. Some physicians recommend surgery as a preventive measure while others reserve this treatment for the onset of symptoms. The risk of postoperative arrhythmias is a reason to defer repair. However, advances in surgical technique are reducing the risks involved.